Perfect to use if your receiver/soundbar/surround system doesn't have HDMI input, this HDMI audio splitter is designed to split 5.1CH/2CH audio from HDMI devices like PS3/4, Fire TV, Roku, Chromecast, Blu-ray player, cable box, Apple TV and more. Plug and play, easy to use. Pass - HDMI pass mode. The audio and video can be convertered from the HDMI output. SPDIF and L/R will not output any sound. 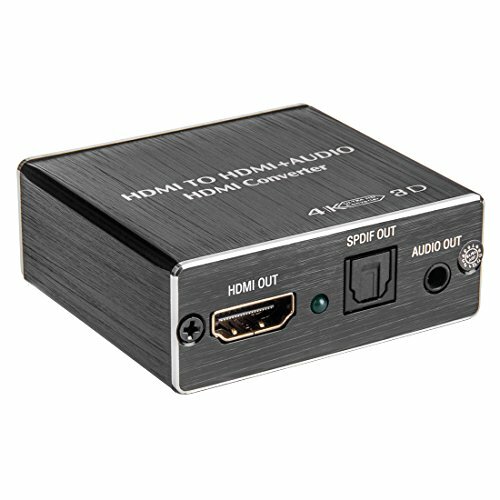 2CH Mode - Extract the digital 2CH PCM stereo audio signal from the HDMI input and the HDMI/ SPDIF and L/R output stereo audio. 5.1CH Mode - Extract 5.1 Dolby Digital / DTS and output via HDMI/ SPDIF. Not Support Dolby Digital Plus audio, it is support DTS Audio and Dolby digital audio. NOT SUPPORT copyright protected content. If you set the switch to 2CH you'll also need to set your AppleTV to Stereo in Settings, otherwise you won't get any sound on Netflix movies that have a 5.1 track. If you have any questions about this product by ROOFULL, contact us by completing and submitting the form below. If you are looking for a specif part number, please include it with your message.